What is Herniated Spinal Disc? How Do You Know if You Have One? By seeing the illustration above, I bet that the first thing that comes to your mind is "lower back pain". Whenever you feel pain at your waste area, doctors usually suspect it as low back pain and will recommend you to undergo CT scan. 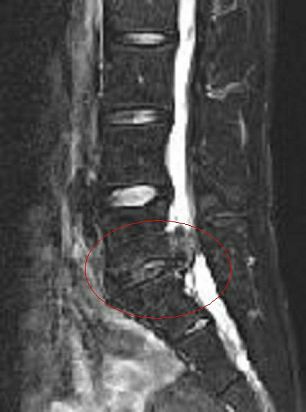 The arrow in the MRI scans above points to a bulging disc pinching on the spinal nerve. 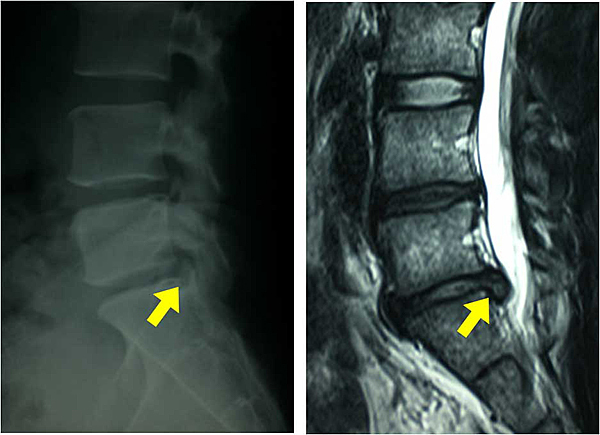 This is known as "Herniated Spinal Disc" or "Spinal Disc Herniation". If a doctor spots this problem, surgery will almost always be recommended. Indeed, low back pain is quite a common musculoskeletal disorder, but most people who suffer from it do not even know what's causing the pain. 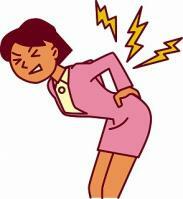 Is it because of herniated spinal disc? NO! You may not believe this, but the real cause of it is nothing more but "stress", or just some sort of delusion. This remains something like a mystery to medical science even in this modern time. Why do I say this? 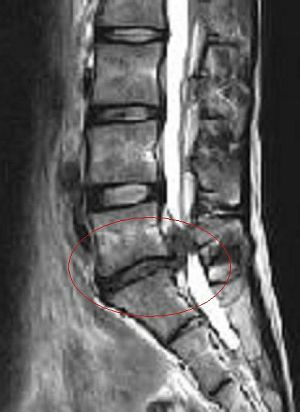 Well, almost all patients who underwent surgery to remove the bulging disc as shown in the image above still claim that pain is still there. What's even stranger is that sometimes the pain just disappears by itself. In addition, there are cases where patients experience no pain despite having herniated spinal disc. It is possible for you to have a herniated disc but mysteriously have no pain. In other words, spinal disc herniation that is causing the pain may not require immediate surgical operation. However, in some cases surgery is needed immediately. It is really a mysterious disorder. These mysterious occurrences have been reported all over the world during the past century. Immediately, renowned doctors of US, Japan, UK, and other countries, started to find the cause of it. They can't find the exact conclusion yet, but they believe that the root of the problem is somewhat related to stress. We have never heard that stress creates herniated spinal disk pain. But it was verified as TRUE. Doctors concluded that such person's brains may not be functioning correctly due to some unexplainable reasons. Of course we know that stress does not create the pain nor it is the main reason of pain. We just believe that stress triggers the low back pain through a certain brain signal. And this was verified well by several researchers. What is the treatment for that kind of stress? Luckily, some of the patients gave us a clue to cure the stress-related spinal disc pain. 1 - A Japanese patient was invited by her British friend to go shopping in Hong Kong and Singapore. At first, the patient was hesitant as she worries about her low back pain, but she agreed and both of them left from the Tokyo airport. Amazingly, since then her low back pain never returned. 2 - One Sunday morning, a man invited his wife (who is the patient) to go on a hot spring to relax after long years of work. Amazingly, in this case, too, the wife never complained of her lower back pain anymore from that time on. 3 - A middle-aged woman received an expensive handbag as a gift for her birthday. Since then, she never complained of her lower back pain. Now, have you figured out the pattern? Medical researchers described that all of these reports show a relation in triggering low back pain and in stopping the stress mechanism within the brain. There's another simple report wherein one patient was given a chance to take care a puppy. Her lower back pain disappeared eventually. Even listening to some certain music may help you alleviate the pain. Many sicknesses are really mysterious in nature. Sometimes, they strangely appear and disappear making the problem difficult to diagnose, and treatment can be difficult as well. Herniated spinal disc pain is one of the most mysterious medical conditions, and medical researchers are screwed up because of its cause and origin.